Budding artists and interior designers will adore The Dollhouse Book from the innovative Rock & Pebble. The Dollhouse Book is a 15 room dollhouse contained in book form. 30 full pages allow kids plenty of room to create, design, paint, collage and doodle to their heart’s content. Each crafty DIY dollhouse is handmade in the UK with FSC mixed sources certified paper from a Swedish mill, and manufactured without any addition of optical brightening agents — but instead bleached using both elemental chlorine free (ECF) and totally chlorine free (TCF) processes. The savvy dollhouse cardboard cover is screen printed by hand with water based inks. Budding artists and interior designers will adore The Dollhouse Book from the innovative Rock & Pebble. 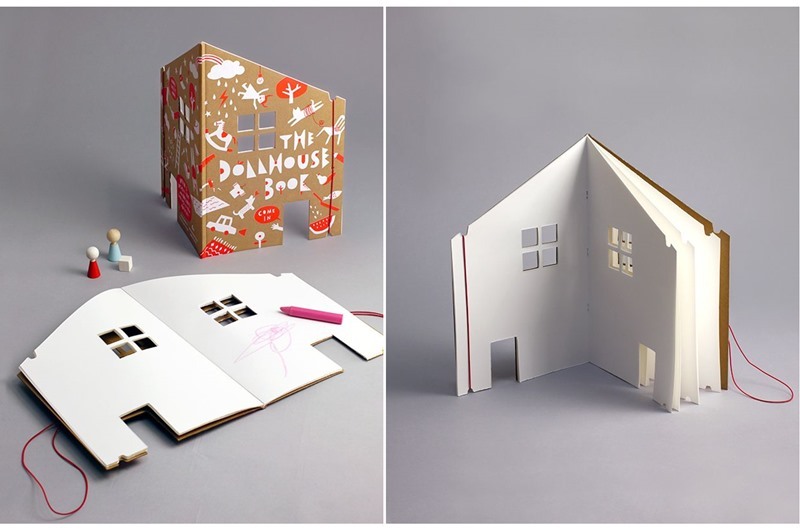 The Dollhouse Book is a 15 room dollhouse contained in book form. 30 full pages allow kids plenty of room to create, design, paint, collage and doodle to their heart's content. Each crafty DIY dollhouse is handmade in the UK with FSC mixed sources certified paper from a Swedish mill, and manufactured without any addition of optical brightening agents -- but instead bleached using both elemental chlorine free (ECF) and totally chlorine free (TCF) processes. The savvy dollhouse cardboard cover is screen printed by hand with water based inks.